We have an application for a magnetic coupling , please see the picture below. Would you be able to supply this type of coupling? If so, please quote on 3 and 10 pieces for our prototype build. 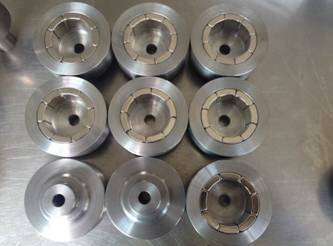 We have a number of different applications requiring similar permanent magnetic couplings with quantities ranging from 25-500 pieces annually. The mating part is not magnetized. The coupling is mounted to a motor shaft and the motor sits on top of a large glass vessel that stirs a propeller in the solution. The motor/coupling is removed periodically from the glass vessel/propeller. The dimensions are in Inches. Please quote and I will verify whether or not there is a corresponding magnetization on the opposite end. We do not have a drawing for the mating part. The attached drawing for the magnetic coupling has had a dimension changed. We do not have a sample since this is the first time we are having this part made. We have to start somewhere. I demand new magnetic couplings including 8pcs arc permanent magnets. 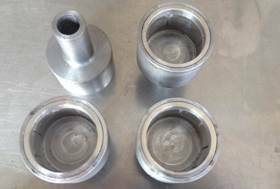 All are identical to each other with the only difference being the bore size where the coupling is mounted on the motor shaft. I have attached a few pictures. The outer magnet will be attached to a small motor shaft. We need an inner magnet which will be underneath a containment shroud attached to a mixing shaft inside a single use vessel. The inner permanent magnet will need to be coated with a medical grade plastic (USP class VI), possibly teflon, similar to a laboratory stirring bar or a medical grade coating (parylene). The inner magnet will be part of a disposable assembly which will be used for 10 days, then thrown away and replaced by a new assembly. The outer magnet will be N45 neodymium rare earth magnet. The inner magnet will be round with a hole in the middle of it for a drive shaft. The dimensions will be approximately 30mm x 30mm with a 10mm thru hole. The inner magnet will not have a steel housing and will just be magnetic material but will require a coating of medical grade plastic (USP class VI), possibly China teflon, similar to a laboratory stirring bar or a medical grade coating (parylene). The magnetic grade of the inner bonded NdFeB magnet will be BNP12 permanent magnet.